I've been waiting to put this one up for an entire year. I found it among my vintage magazine collection right after Thanksgiving last year and was kicking myself for not finding it in time. But that's okay. The reasoning? The illustrator is listed as Lorraine Fox. Why am I happy about this? 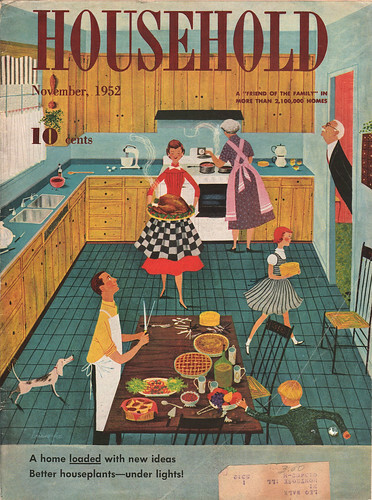 Because a reader of my blog got in touch with me in August of this year and told me that they found out that it was Ms. Fox who did the wonderful illustrations for that Better Homes & Garden Decorating Book I mentioned on The Ward-O-Matic way back in 2005. The same illustrations that I used for inspiration for that Victory Vintage wall in Decatur. One big illustrator mystery finally solved! Big thanks to Ashlee for her eagle eye. I enjoy seeing all the retro illustrations you post.